The Regrow Project was an undergraduate student research project funded by the University of Texas at Austin Green Fee Grant. In this experiment, we grew food from scrap hydroponically while measuring the crop yield, water and energy consumption. Two trials were conducted, the first in the Fall of 2017 where lettuce was regrown from lettuce stumps, and the second in the Spring of 2018 where basil was regrown from cuttings. In both trials, the same plant was grown from seed in identical settings to compare water and energy consumption between growing plants from seed versus growing plants from food scrap. In both trials, it was found that plants did regrow from food scrap, however they did not hold any advantage over growing plants from seed. Plants grown from seed used around the same amount of water an energy as those grown from food scrap. Plants grown from seed also showed a higher yield percentage than plants grown from food scrap. It is known that some common foods will regrow into new plants from their food scrap1. These foods, specifically broccoli, cauliflower, onions, potatoes, lettuce and other root vegetables and leafy greens, can potentially re-grow into new plants assuming there is enough meristematic tissue2 remaining on the food scrap. In early trials of this experiment, we had the most success sprouting new roots in water. 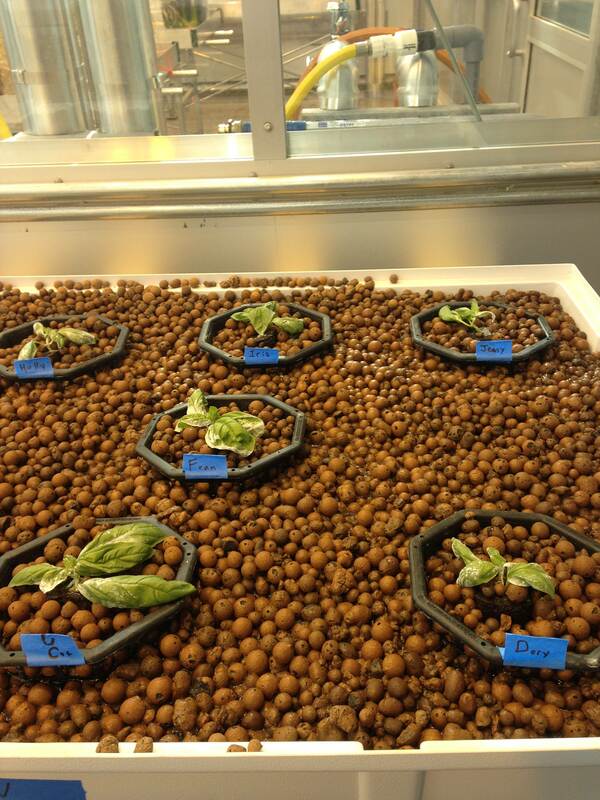 With this, we decided to perform the experiments in hydroponic systems3. For the first trial of the experiment, we decided to re-grow lettuce from lettuce stumps. Lettuce is considered a winter crop and we expected it would do well in the late Fall. The first trial of this experiment was conducted in the old greenhouse atop the Welch Building on UT Campus. Because the Welch Building was under demolition at the time, a backup power supply and internet source were required to conduct the experiment. Click to See Full System Schematics. Unfortunately in the recirculating tub system, we saw significant leaks at the fixture points. With this we decided to use a single tub system only and to instead use an air bubbler and small submersible pump to keep water flowing inside the tub and to add oxygen. See Figure 3. The regrow plants from were left to grow in this setting for 28 days from October 20th to November 17th 2018. Afterwards the control plants were left to grow in the same setting for 28 days from November 1st to November 29th 2018. The reservoir water level, pH, conductivity (nutrient level), temperature and growth height were monitored every 2-3 days during this period of time. Figure 5: Final height of Regrow Plants after 28 days. Figure 6: Final height of control plants after 28 days. Our greatest challenge for Trial 1 was fighting leaks at the junctions between the grow tubs and PVC pipe in our original two tub design. Despite the use of bulkhead fittings and rubberized paint at points of contact, leaks continued to occur. We believe this is due to the plastic of the tubs being too thin. These Sterilite tubs (made of plastic #5, Polypropylene) are designed to be storage bins and not to hold liquid. For the second trial of our experiment we decided to rebuild the recirculating system with containers designed to hold large amounts of liquid. The great city of Austin, Texas is famous for having very unpredictable weather. 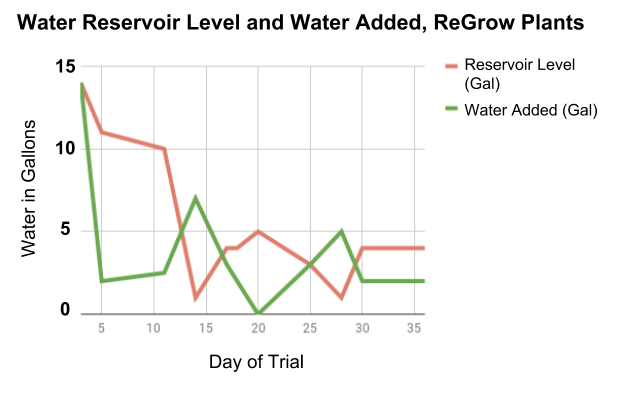 Despite planting our lettuce in October, we experienced spikes in temperature up to 90 degrees Fahrenheit for several weeks during the trial. Lettuce and other winter crops thrive in temperature ranges of 60-65 degrees Fahrenheit 8. When temperatures exceed this range, lettuce and other winter crops will produce inedible flowers instead of lettuce heads8. With this, we did see significant growth in several of our lettuce plants, however this growth went towards producing lettuce flowers instead of lettuce heads. Towards the end of the first trial, we saw algae9 begin to appear in the tubs with the plants. Algae can be harmful to plants and aquatic life in that it competes with other organisms for oxygen and nutrients in the water. Before the algae appeared in our grow tubs, five of the eight plants were regrowing. However, with the algae appearing we noticed our yield reduced from five to three plants. 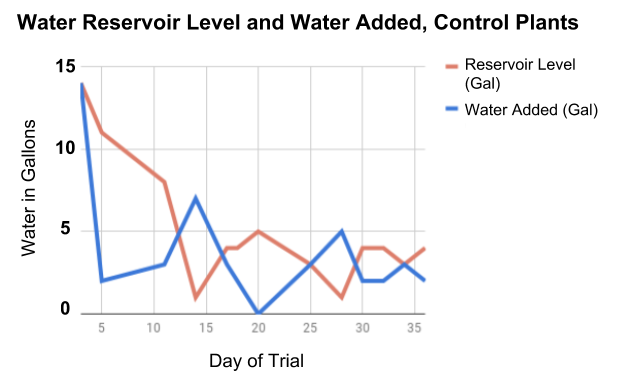 We do not claim this correlation is causation for our loss in yield. There are many other factors that could have contributed to this. However, for our second trail we aimed to reduce the amount of water exposed to sunlight in hopes to prevent algae growth. During the Winter Break of 2017/2018, the Welch Greenhouse was torn down and all research was moved to the new greenhouse on top of the Norman Hackerman Building on campus. This new greenhouse provided atmospheric heating and cooling, and reliable electricity for research projects. For Trial 2 of the Regrow Project, we decided to grow basil plants as we were nearing summer and the weather was warming up and basil does well in higher temperatures 10. ReGrow basil plants were grown from basil cuttings while control basil plants were grown from seed. To encourage rooting, basil cuttings were dipped into a rooting hormone powder, as was done in Trial 1. The cuttings and seeds were placed inside a peat moss plug11 which was placed into a grow bed filled with expanded clay pebbles5 for support. To measure plant growth, we decided to measure plant weight at the beginning and the end of the trial using a small scale. 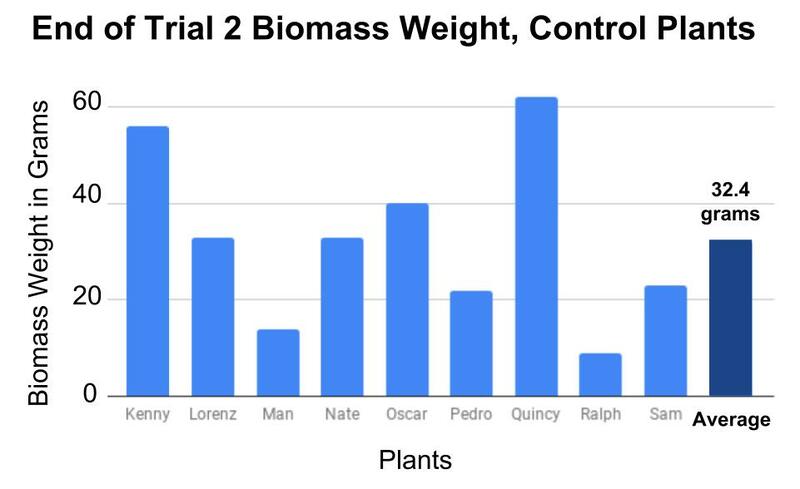 We felt this was more representative of biomass than in Trial 1 as some plants did not grow very tall, but did grow wide. All basil cuttings and basil seeds weighed less than a gram at the beginning of the trial, so we considered our starting weight to be zero grams. Significant energy was saved in Trial 2 due to the removal of the backup power generator. The new greenhouse provided reliable electricity so for Trial 2 the backup generator was no longer needed. Our energy analysis does not include the energy required to cool the greenhouse as this data was not available. It is most likely that cooling energy for the greenhouse over the summer would have contributed to the majority of energy consumption. Both Trial 1 and Trial 2 of the ReGrow Project showed that plants can in fact be regrown from food scrap if they contain enough meristematic tissue to do so. However, both trials also showed that plants grown from seed grew just as fast, with similar water and energy consumption, while showing higher yields of healthy thriving plants. Growing plants from seed proved to be more efficient and effective, as mother nature has shown us for the past 470 million years12. However, it was still very beneficial to see that some plants can regrow from food scrap, making for a potentially more effective use of food waste. This project was an excellent learning experience for real world challenges in engineering systems. Unexpected leaks, power outages, and unpredictable weather patterns gave way to practice engineering solutions to continue on with the experiment. We were surprised to find how little water the plants themselves required for growth and that most water loss was due to leaks and evaporation. We also greatly underestimated the importance of maintaining ideal temperatures for plants to grow, otherwise plants will grow in undesirable ways, such as producing flowers instead of foliage. When using natural lighting, a lot of heat from the sun’s rays can get trapped inside the greenhouse. As such, we anticipate a great deal of energy went into the greenhouse’s cooling system to keep the rooms at a reasonable temperature for plants to grow. 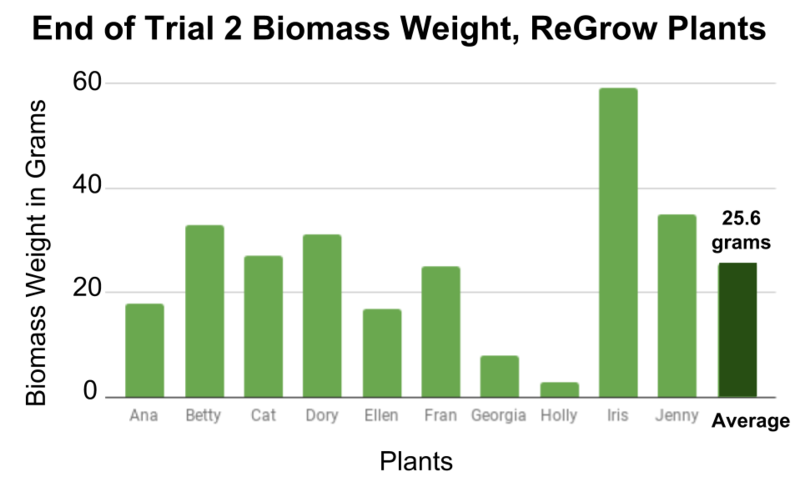 Unfortunately this data was not available to us to analyze this energy usage. 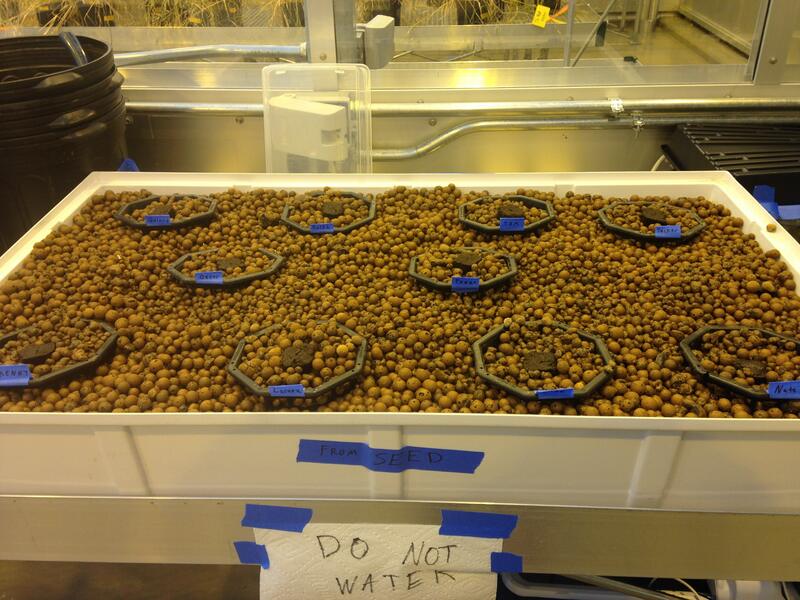 Between trials, all grow tubs, clay pebbles, and probes had to be cleaned thoroughly to kill all algae, fungi and bacteria that had appeared during the trials. The grow tubs and clay pebbles had to be soaked in bleach and algaecide to ensure they were sterile enough to be used in another trial. After this, the grow tubs and clay pebbles had to be thoroughly rinsed to remove all residual bleach and algaecide that could kill the plants in the following trial. As such, a lot of water was used to simply clean and sterilize the grow beds and grow media to prepare for the following trial. En estimated 93 gallons of water per system per harvest was used just for cleaning alone. It was brought to our attention that this amount of water wasted could be nontrivial in a commercial hydroponic facility that utilizes hundreds of grow beds. Furthermore, the wastewater that was dumped from the reservoirs contained fertilizer, bleach and algaecide, all of which could cause serious damage to a receiving stream if not treated properly. The ReGrow project was an excellent learning experience for first hand knowledge in engi- neering and science. We are eternally grateful to the Green Fee Grant for making this learning experience possible. A very big thank you to undergraduate research assistants Maneill Parekh and Natalie Ozor for their assistance in conducting these experiments. I would also like to thank green house manager Shane Merrell for his expertise and assistance with this experiment. Thank you to Dr. Upshaw and Dr. Webber for advice and guidance on this project. And of course a very big thanks to Green Fee Grant for providing the funds to make this project possible! 1. Beaty, V. (2014, Feb. 20). 25 Foods You Can Re-Grow Yourself from Kitchen Scraps. 7. Singh, H., Dunn, B. (2016, Oct) Electrical Conductivity and pH Guide for Hydroponics. Oklahoma Cooperative Extension Service. 8. Sanders, D. (2001, Jan. 1) Lettuce Horticulture Information Leaflets. 10. Davis, J. (1997, May. 31) Basil Horticulture Information Leaflets. 11. Root Riot. Growth Technology.